The topic of cleaning vinyl floor for the purpose of this article, we will address an integral part of floor cleaning and maintenance; high-speed dry burnishing of the floor finish (wax). Commercial facilities that demand high gloss floors known as the “Wet Look” implement the burnishing process as part of their cleaning vinyl floor program. The following discussion on burnishing or buffing floors will include the different types of buffing, burnishing and the types of equipment to complete the burnishing task. Any commercial end-user also understands that burnishing also assists in repairing minute scratches, scuffs and/or black marks. Additionally the article will cover the simple steps of burnishing and the proper way to burnish when cleaning vinyl floors including the labor requirements. For the purpose of this discussion we are addressing both resilient floors including non-resilient floors that have been coated with a floor finish, polish or wax. When we say dry burnishing as part of the cleaning vinyl floor, we are referring to all types of vinyl floors and even those that are resilient including the following. 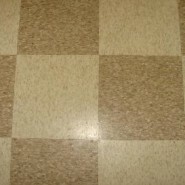 If the reader is interested in tile floor cleaning for a residence, please click on the following link and it will take you to another article covering residential floor tile cleaning (Tile Floor Cleaning – Floor Finish Coated Tile Procedures, Product and Tools) or for commercial cleaning vinyl floors click on the following link (Cleaning Tile Floors – Floor Finish Coated Tile Procedures, Product and Tools). Dry Clean floor by dust mopping. Wet clean floor with an automatic scrubber equipped with RED cleaning pads with cool water and approved professional grade floor cleaner, diluted according to the label directions. A Neutral cleaner is preferred. Prepare a High Speed Burnisher (Operated by Propane, Battery or Plug in Electric with a High Speed Burnishing Pad. Begin dry burnishing the floor until the entire floor that was designated for burnishing has been completed. Always scrub the floor prior to burnishing. Failure to properly clean the floor will lead to grinding soil deep into the floor finish (wax) which will cause the floor to be stripped prematurely that will produce unnecessary expenses to the budget. Change burnishing pads often. This can be accomplished by using a new pad, flipping the pad over to use the opposite side of the pad or clean the pads after using to be used again. Failure to use clean or new pads often will lead to poor burnishing performance and can actually damage the floor finish instead of improving the look and gloss of the finish (wax). Proper high-speed dry burnishing a floor requires the proper time. The optimum walking speed with the Burnisher is at a pace of 1.5 linear feet per second. This may seem slow but it will deliver the best results. At this correct speed, small scratches, blemishes, scuff and black marks will be removed from the floor and maximize the glossiness of the floor. High Speed Burnishing Pad choice is also critical. Not every floor finish will respond the same way with the same burnishing pad. So take the time and discuss with the floor finish manufacturer which is the best High Speed Burnishing pad for their floor finish. Dust mopping after burnishing is a best practice and should be a part of the burnishing process. Dust mopping after burnishing rids the floor of any fine particles of dust that is caused by dry burnishing. High Speed Burnishing is accomplished by the actual honing of the floor finish (wax) on the floor. A common myth is that high-speed burnishing melts the wax and reflow occurs thus leveling the floor wax smooth which creates a smoother surface that produces a high gloss. This is 100% untrue. It works by physically honing or smoothing the floor wax to create that high gloss. High Speed Burnishers are designed to be used in a dry buffing process. They come in a variety of diameters but the most come sizes are the 20 inch and 27 inch sizes. The following are the way that high-speed burnished are powered and which provides the best results. Propane Powered: Best Results. Recommended Machine Type for the Highest Gloss with the least amount of labor to achieve the best results. Battery Powered: Good Results but not close to the results of a propane powered Burnisher. Plug In Electric Powered: Good Results but less than Battery Powered.